Do any of these lyrics sound familiar? Whether it’s the soulful vibe from the 1970s, a melody from Michael W. Smith, or Jack White singing over a soft guitar riff, the idea of friendship resonates in our culture. 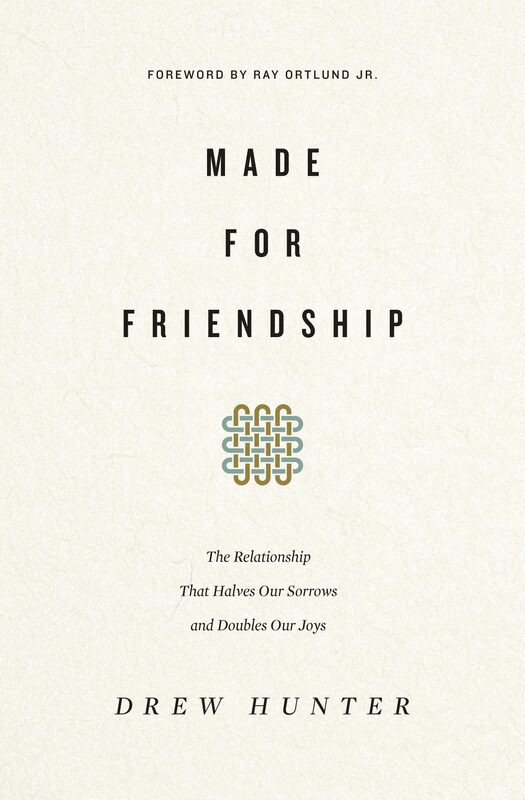 In Made for Friendship: The Relationship that Halves Our Sorrows and Doubles our Joys, Drew Hunter—teaching pastor at Zionsville Fellowship in Zionsville, Indiana—tells us we were made for friendship based on the image of the One who created us. Friendship is innate to humanity because it is innate to God. Hunter’s premise is simple yet profound: “The greatest power for becoming a better friend is being befriended by the best Friend” (15). Friendship exists because God befriended us, and created us to befriend one another. But though friendship is crucial to human life, we live in a world where friendship with God and friendship with one another has been fractured and frayed. Because of this dramatic loss, we’re unable to experience the fullness of joy even in the best of our (still broken) friendships. While the fracturing of friendship is a result of living in a Genesis 3 world, that fracturing has noticeably increased in recent decades. True friendship escapes us due to busyness, an increasingly disembodied social experience, and a shallow definition and experience of friendship in general. Our dilemma, Hunter observes, is that our soul longs for the intimacy we once had with God and each other. It’s our “primal longing” and hence it’s “essential for the good life because God wove it into the fabric of the world” (43, 41). Friendship exists because God befriended us and created us to befriend one another. After establishing our need for friendship, Hunter moves into the practical implications of what friendship accomplishes. Friendship completes our earthly happiness (as far as it is possible). Leaning on an excellent line from J. C. Ryle, Hunter takes readers through the journey of how friendship “halves our troubles and doubles our joys” (59). Our joy in friendship comes from sharing our joys with others. Additionally, our sorrows and burdens are lightened when we walk with a dear friend amid those trials. Friends are consistent and present. Hunter, with a sneaky rick roll any good friend would appreciate, asserts, “A real friend will never give you up or let you down. He will never turn away or desert you” (82). The formula for friendship here is simple: “Honesty + Acceptance = Real Friendship” (87). But the best and deepest bond can only exist if Christ is at the center and Christlikeness is the goal (92). If the heart of true friendship is Christ and the goal Christlikeness, how should we cultivate friendship? Hunter has a few practical suggestions. First, we need to understand how to say yes to friendship by saying no to other things. Second, we need to be aware of forming new relationships where we live. Third, we should consider the weight of losing or straining friendships as we consider moving. Sometimes moving may be necessary, but extra wealth shouldn’t be sought at the expense of friendship. Though friendship requires immense work and dedication, simple things can contribute to its growth. Finding more opportunities to get together, making time to call or video chat, engaging in spiritually enriching conversation around a book or Scripture, and other “side-by-side” activities are all ways friendships can grow. Hunter reveals nothing profound or new, yet he does help readers reassess their priorities through the filter of friendship. His suggestions are simple yet will require a reorientation of our life so that meaningful relationships may be cultivated. Hunter observes, “In the end, the best advice for cultivating friendship is not to find a better friend but to become one” (116). Hunter weaves biblical truth, including theological and historical depth, into this short and approachable book. He dedicates the last chapters to a biblical theology of friendship and the character of Jesus Christ as friend. Among all the relationships we have to Jesus, one that is often overlooked yet describes him best is that of friend. When we see the cross as an act of friendship, when we discern that in Jesus we’re never truly alone, and that in Jesus our circle of friends can and should increase dramatically, we can better understand how friendship is the “goal of our salvation and the ultimate end of our existence” (150). When we have entered into the covenant of friendship by faith in Christ, we can “enjoy the privilege of walking every step, every day, onward into the eternal world of friendship to come” (157). Christians aren’t immune to the disconnecting devices of our age, and thus we need all the biblical wisdom we can get in order to pursue friendship. Made for Friendship is timely and urgently needed for our cultural moment. Christians aren’t immune to the disconnecting devices of our age, and thus we need all the biblical wisdom we can get in order to pursue friendship. Hunter’s gift to the church is the simple clarion call of pursuing friendship. Were we to heed his appeal, how might it affect our witness outside the church and our ministry inside? How might it increase our joy? How might it better inform our view of redemptive history and the person and work of Jesus Christ? I believe that if we sit across the table from this Christian friend and glean his wisdom, every aspect of our Christian life will change drastically. So pull up a chair and listen to the wise words of this friend as he relays to you the message of the Great Friend. Coleman Ford is a PhD student in church history at The Southern Baptist Theological Seminary in Louisville, Kentucky, and is writing his dissertation on Augustine’s practice of friendship. He lives in Dallas, Texas, with his family and serves as a minister at The Village Church.